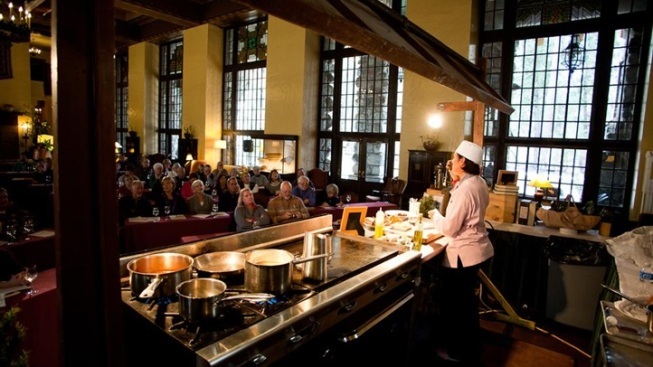 Venture to The Ahwahnee in the new year and burnish those kitchen chops. DELICIOUS DENOUEMENT: The run-up to the holidays, if you're a dedicated home cook who likes to mix in a few adventurous dishes with some tried-and-true-and-tasty classics, can be a veritable whirlwind of get-it-done proportions. You have to make sure the invitations are in the mail in a timely manner, you have to check on your guests' allergies and preferences, and you have to find the culinary challenge within yourself, to push your talents just a smidge past last year's fabulous feasts. Which all leads, in the end, to a lot of applause, and the gratitude of your guests, and one pretty quiet January. No complaint there -- busy December people do crave a slower first month of the year -- but a cook who likes the thrill of staging a savory show can still secretly long for December's bustle and more cooking good times. Those cooking good times rev up right after New Year's Day, in Yosemite National Park, when the Chefs' Holidays return to The Ahwahnee for several sessions of tip-sharing, skill-sharpening, and general camaraderie built around a love of cuisine (and making that cuisine, too). The dates have been revealed for the 2016 happening, which opens on Jan. 10 and closes down the kitchen for another run on Feb. 4. EIGHT SESSIONS: There's an octet of learning/eating experiences, so landing upon the two- or three-day gourmand gathering that appeals to you the most should be a pretty easy thing to do. Maybe you're a fan of Chef John Cox of Sierra Mar at Post Ranch in Big Sur or Suzanne Goin of Lucques in Los Angeles. Both famous food-minded honchos'll visit The Ahwahnee, for different sessions, along with winemakers who are equally as well-known. It isn't all demo-ing, though, during the Chefs' Holidays; a Meet the Chef reception, a gala dinner, and kitchen-themed behind-the-scenes tours are also what's on your brimful plate. Think of this as a way to up your cookery mojo, just after you've spent a few weeks showing off your stuff for family and friends. Upping your cook skills, though, among accoladed chefs is the added pleasure, as is being in one of the great national park lodges in the heart of wintertime. Cozy and culinary, both, together, all at once.